Being a native of Tirunelveli I always proudly says that I am from Tirunelveli Dist. Tirunelveli one of the most charming places in Tamil Nadu and It is also home for natural wonders in its surroundings that attracts tourists from different parts of the world. 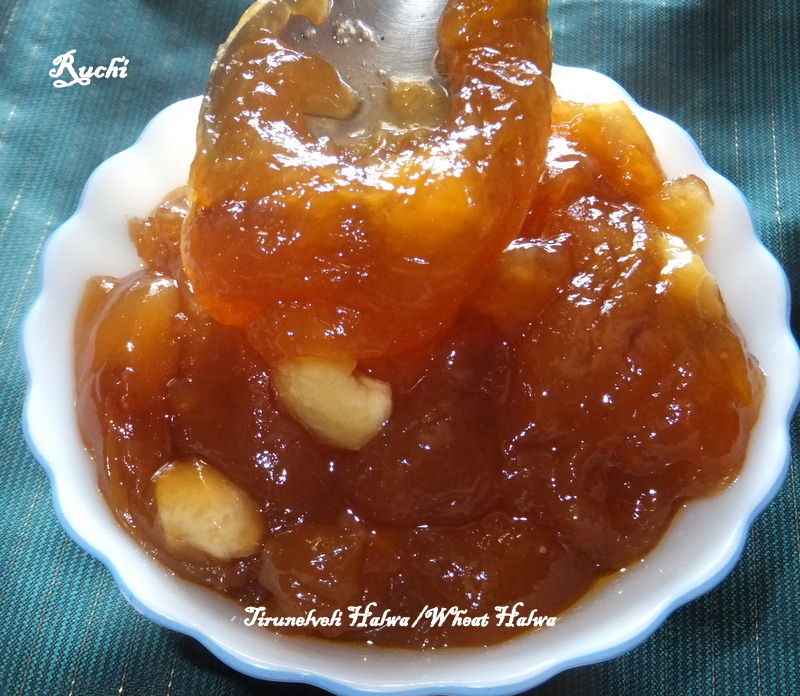 Tirunelveli is also known as the Halwa town. 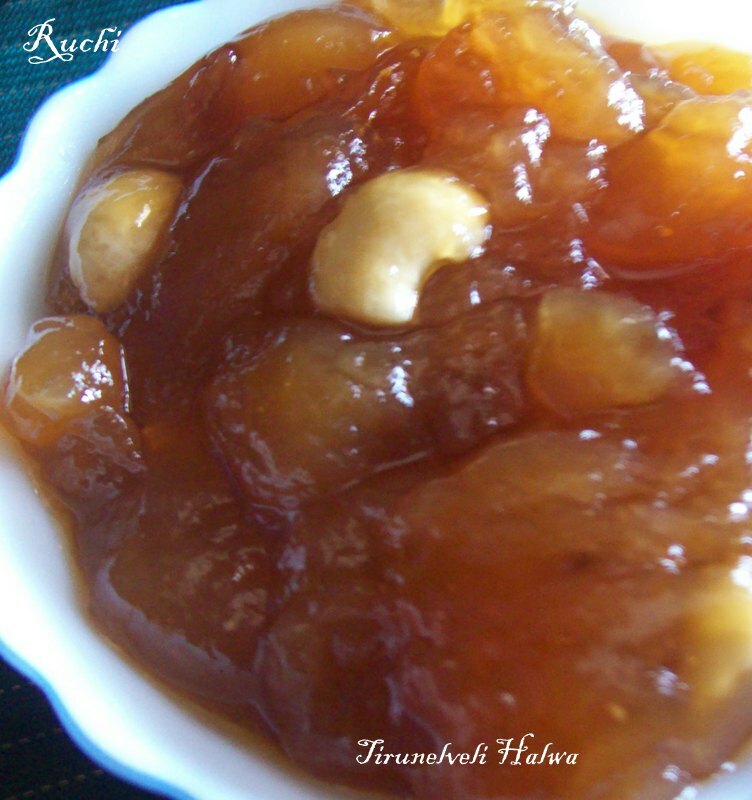 Tirunelveli is popular state-wide for its famous halwa which is a sweet dish made primarily from wheat and sugar. Grind the wheat with some water and extract the wheat milk.To get the milk, grind the wheat in mixie/blender for 5 minutes and filter out the milk. Grind the wheat with fresh water again and filter. Repeat this at least 3 times. 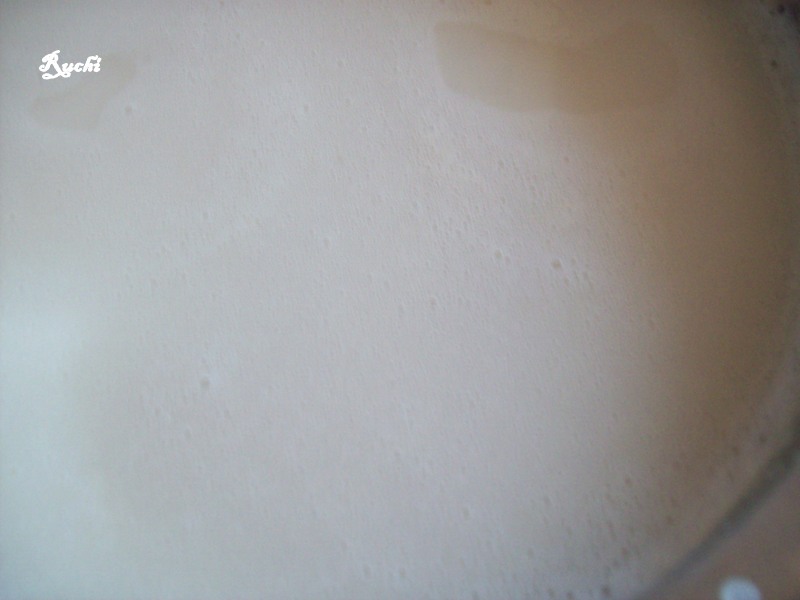 The extracted milk needs to be undisturbed for min 10 hours or overnight.In the morning, you will find that the thick milk has settled at the bottom and then remove the top layer of water and retain only the thick milk.In this milk add 4 to 5 cups of water and mix well. Then In a heavy bottom pan add water and sugar, cook on medium flame and prepare 1 thread consistency sugar syrup. 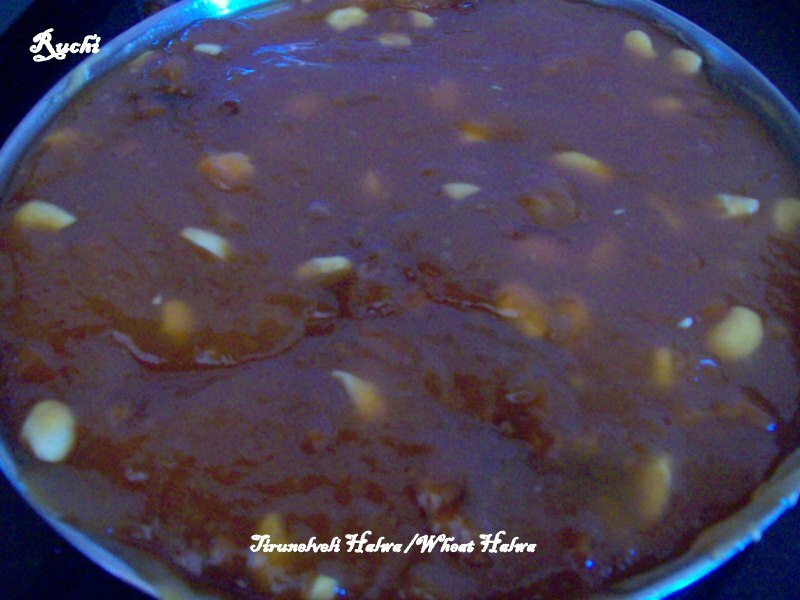 Once sugar syrup is ready reduce flame to slow and add extracted milk slowly and keep stirring. 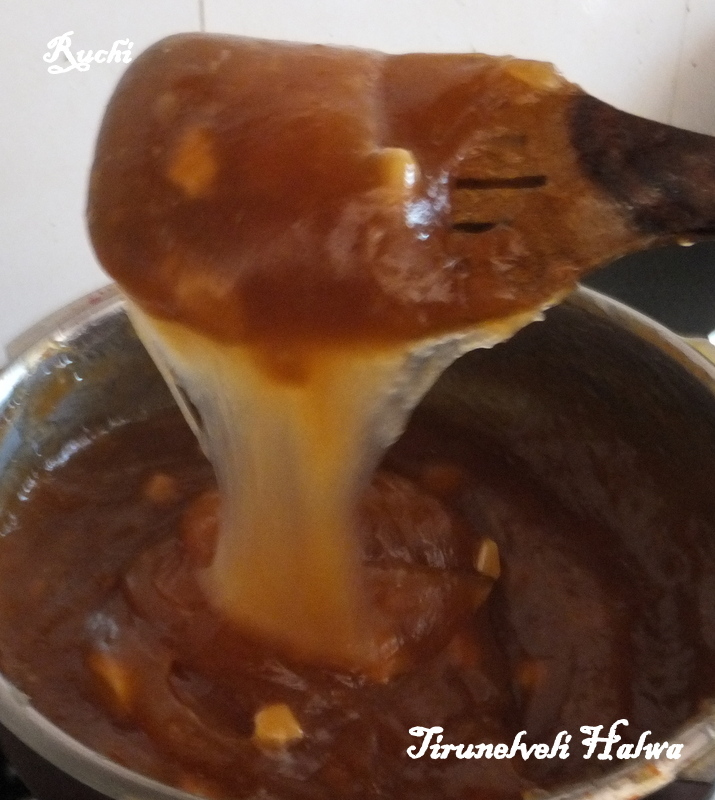 Once it reaches semi solid stage, add ghee little by little and keep on stirring.After another 1 hour or so, the ghee will start oozing out.The halwa will look transparent as well.When you take the mixture in the laddle, it should slide and not stick to the ladle. Add cashew and stir for another 10 mins. Mix well add more ghee if you need. 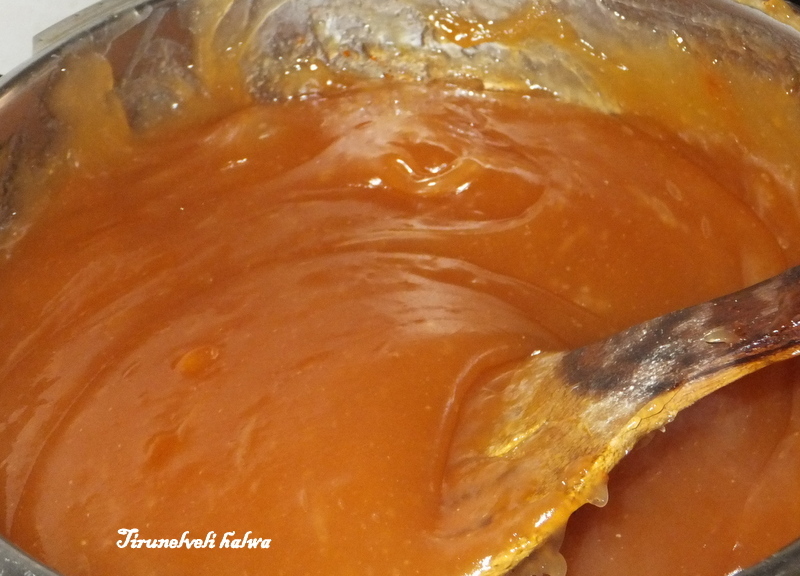 When the ghee oozes out in the corner the halwa is done so keep stirring until it will be glossy, forms a mass. Switch off the flame and you can either serve it hot directly or place it on a greased plate and cut into any shape. That looks simple & delicious. What do you do with the caramalized sugar? do you add to the rest of the sugar while making the one thread consistency syrup?